The test flight of India’s heaviest and upgraded rocket, the geosynchronous satellite launch vehicle (GSLV)-Mark III, is set to be carried out between December 15 and 20. “The Rs 155-crore mission is aimed at testing the rocket’s atmospheric stability. The incidental component of the mission is to test the crew module,” said M Y S Prasad, director, Satish Dhawan Space Centre SHAR, Sriharikota. The rocket does not have the required cryogenic engine for putting four-tonne satellites into orbit. “The cryogenic engine is under development and will take two years to be ready,” said Prasad. On the crew capsule, designed to take three members, Prasad said the aim was to test the safety parameters when it re-entered the atmosphere. He added the rocket would rise to a height of up to 120 km, after which the crew capsule would be detached. Subsequently, it would fall into the Bay of Bengal, 20 minutes after the take-off. The capsule would be covered by an Indian Coast Guard ship. Indian Space Research Organisation (Isro) Chairman K Radhakrishnan said the vehicle would attain a velocity of 5.3 km a second. During its ascent, the aerodynamic characterisation and control system would be tested. “We are also using the opportunity to test the re-entry characteristics of the crew module, by flying an unmanned crew model in this,” he said. The mission is conceived and designed to make Isro self-reliant in launching communication satellites of the INSAT-IV class, which weigh 4,500-5,000 kg. The existing GSLV-Mark I & II varieties are capable of placing the INSAT–II class of satellites, weighing 2,000-2,500 kg, into the geosynchronous transfer orbit. Earlier, Radhakrishnan had told Business Standard the agency was planning to launch an experimental mission, with a passive cryogenic engine. According to reports, the National Democratic Alliance had increased the budgetary allocation to develop the vehicle from Rs 10 crore to Rs 171 crore. Once the GSLV-Mark III is ready, India doesn’t have to depend on European space consortium Arianespace to carry its four-tonne class of INSAT communication satellites. It would also enhance India’s capability in the multimillion dollar commercial launch market. 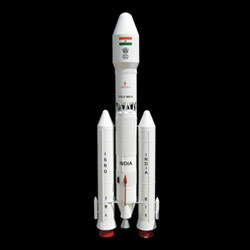 The GSLV-Mark III is designed as a three-stage vehicle, with a height of 42.4 metres and a lift-off weight of 630 tonnes. The first stage comprises two identical S200 large solid boosters, with 200 tonnes of propellant strapped to the second stage. The third stage is a C25 LOX/LH2 cryo one. The first flight of the GSLV-D1 was on April 18, 2001, when the 1,540-kg GSAT-1 was launched. This was followed by six more launches.